Fantasy adventure games often have you going on grand adventures in the search for powerful artifacts, on the way doing battle against vicious and terrible monsters. From Descent to Legends of Andor and more, fantasy games tend to invoke the epic scale of a Dungeons and Dragons campaign, delving into great underground kingdoms or crossing vast expanses of forest on the hunt for victory. Not so Darkest Night. This is a stripped-down experience that distills fantasy gaming to a few basic mechanics and a few core truths: The bad guy is more powerful than you, most of the world is working against you, and you probably won’t succeed in the end. The austerity of the core game is enlivened somewhat by the collection of heroes available right out of the box and in the game’s two expansions, though even with some creative takes on fantasy tropes and an interesting leveling-up mechanic the game may not have enough going for it to keep you coming back. Darkest Night is a co-operative game in which the players work to defeat the Necromancer. The game ends one of three ways: For the players to win, they must either defeat the Necromancer in battle as, or they must collect three Holy Relics and return them to the Monastery. The Necromancer wins if at any point there are five Blight tokens at the Monastery. When setting up the board, players have the option of using one of two formats – a cardstock, 11 x 17 board, or a thicker cardboard version that is assembled from three puzzle pieces. The board represents the locations the players will explore throughout the game. The game starts with the selection of heroes. Each hero has a Hero Sheet, which offers a short description of the hero and two different tracks – Grace and Secrecy. Grace is essentially the hero’s hit points, while Secrecy determines how likely it is that the Necromancer (or some other monsters) will be able to find you and track you as you move about the board. In addition, each hero has a custom deck of 10 powers. 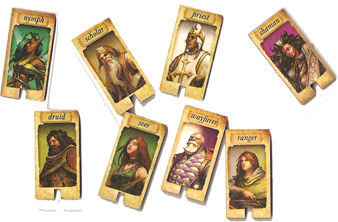 Within the deck are four powers marked with a symbol; of these, the player picks three as her starting powers. The deck is then shuffled and placed near the hero sheet. Over the course of the game, certain actions will allow the player to draw additional powers from the deck to augment her hero. 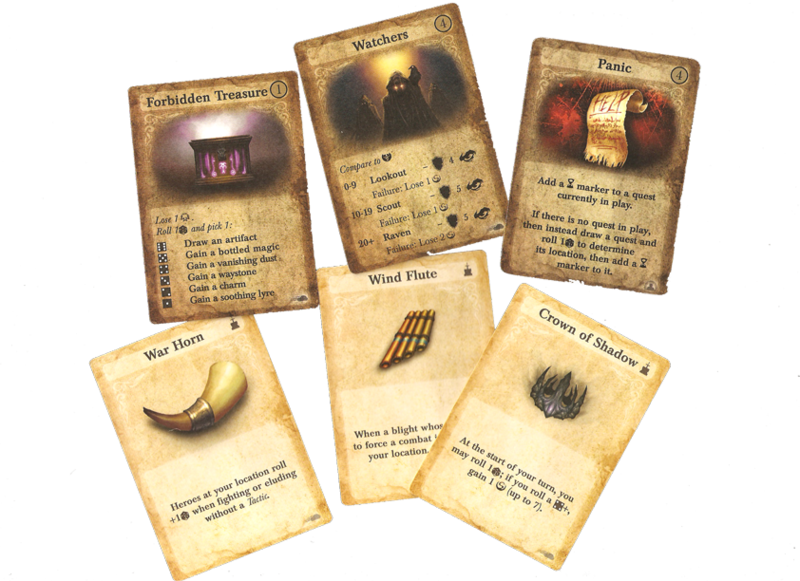 Three other decks are then created – the Map deck, which will determine where enemies appear on the board throughout the game, as well as what kinds of treasures are found during search actions the players may take. An Event deck is created, from which players will draw a card each turn throughout the game. The Artifact deck is shuffled and set up near the board, creating a pool from which treasures may be drawn, and finally the various tokens representing potions, keys, and so forth are then set up. Enemies are then aligned against you. The Necromancer token is placed in the center of the board, tokens representing various threats – called Blights – are organized near the board within reach of all players. The top card of the Map deck is then drawn and Blights are places on all locations on the board. Play then begins. The game is played in two phases: hero turn, and Necromancer turn. A hero starts by drawing an Event card, which will generally involve fighting a monster or dealing with some sort of threat, often determined by the hero’s current Secrecy or Grace score. The With an Inner Light expansion introduces Quests, which are events that will require the hero to do one or more things – generally, traveling to other locations around the board – to resolve, resulting in a treasure if completed or some nasty effect if not. Once the Event card is resolved, the hero may take one action. These are: Move one space to a new location, Hide to refresh powers, Attach a Blight token on the hero’s current location, Search for treasure, or use a Power that requires an action. Heroes in the Monastery may also Pray to heal. Once this action is taken, the hero must then defend against any Blight tokens on her space – note that defending against a Blight does not remove it from the board, only Attacking it as an action can do this. Once all heroes have completed their action, the Necromancer goes. In a five-player game, the fifth player controls the Necromancer (along with some other special abilities); otherwise, a player is tagged to execute the Necromancer’s actions. First, the Darkness track is advanced by one or more, depending on the presence of certain Blights on the board. Then, the Necromancer moves. A die is rolled and compared to each hero’s Secrecy score. If the roll is greater than the Secrecy score, the Necromancer moves one space closer to that hero, or the closest hero if the Necromancer detects more than one. If no heroes are detected, the Necromancer follows a path as indicated on the game board, corresponding to the number rolled on the die. At the end of the Necromancer’s turn, a Map card is drawn and a Blight is placed on the Necromancer’s current location as determined by the Map card. Control then returns to the heroes, and play continues. Searching is the key action heroes will need to take. Via searching, they can find keys that will help them unlock the Holy Relics needed to defeat the Necromancer. They will also find treasures and other items that will give them combat bonuses and special effects throughout the game. Of particular importance is the ability to gain new powers. Occasionally, a search will result in a treasure or effect that allows the player to draw a new power from her power deck and put it into play immediately. Powers are what make each hero unique. Most heroes have a starting power that gives them some sort of basic combat ability; the rest of the powers will vary wildly from hero to hero and can effect everything from movement, to healing capacity, to searching bonuses, and more. Powers are used a variety of ways. Sometimes, the power just gives the player a bonus and is not exhausted; more often, the use of a power requires it to be exhausted, in which case the power cannot be used again until the hero uses a Hide action and refreshes all exhausted powers. Careful management of powers is extremely important in Darkest Night, as poor planning can leave a hero stranded without the ability to defend himself or aid his companions. As noted above, to win the players must either defeat the Necromancer in battle or find three Holy Relics and return them to the Monastery. Holy Relics are also needed to fight the Necromancer, as the Necromancer can only be defeated on a roll of 7 on a six-sided die, so heroes will need the attack bonus conferred by a Holy Relic in order to succeed on this roll. Holy Relics are obtained by searching for Keys at various locations around the board, and eventually cashing in found keys for a Relic. At the same time, the Necromancer us moving about the board generating Blights. If any effect would cause a Blight to be generated at a location that already has four Blights, that new blight is instead generated at the Monastery. In this way, the heroes have very difficult choices to make throughout the game. With only one action available to them, they can either fight Blights to remove them from the board, or Search for keys to unlock Holy Relics, but not both. Any time spent not fighting Blights means more opportunities for these Blights to overrun the Monastery, but without searching the heroes will never have the tools needed to defeat the Necromancer. Teamwork and careful planning are critical to victory in this game. If you skip ahead to the tl;dr part of this review you will note that The Five are overwhelmingly negative, which is unfortunate since the game probably deserves better than that. The things that are bad about it are glaringly bad, so I think it’s fair to point them out, but they are ultimately pretty small things that don’t compromise the overall game. They’re like splinters in that web of flesh right between your fingers – tiny, but painful beyond their size and tough to ignore. Despite some of the flaws with its components, the overall presentation of Darkest Night is gorgeous. The art is really well done across all aspects of the game, from the hero sheets to the Event cards to the little cardboard tokens. The overall look of the game is dim and gritty, definitely a dark fantasy theme – this is a game that screams struggle from the get-go. The laser-cut tokens are problematic and unnecessary, but I give Victory Point Games credit for attempting an extra level of quality in their game pieces; unfortunately, the effort just didn’t succeed. I do enjoy the quiet ritual of opening up a new game, popping all of the pieces from their cardboard sheets and organizing them into their little bags or whatnot, but the additional step of needing to clean the soot from the edges of each laser-cut token was an unnecessary and unpleasant step. Darkest Night is hard. That needs to be said up front. The game will begin to work against you quickly. The Darkness track will mount, increasing the ability of the Necromancer to hurt you. Meanwhile, Blights will be popping up across the board like fat earthworms after a soaking rain. All the while, every turn sees your heroes harried by the results of Event cards, facing zombie hordes and other monsters that will sap your ability to face the Blights aligning against you. Against all this, each hero can only do one thing each turn. It can feel like a slog, trudging step by heavy step against the Necromancer. If you win the game, it is an ecstatic feeling, a real sense of having overcome the odds. If you lose, however, that loss seems inevitable, and that is where the game gets a little rough. There are other games in which the enemy is stronger than you. Arkham Horror is a favorite example that comes to mind. 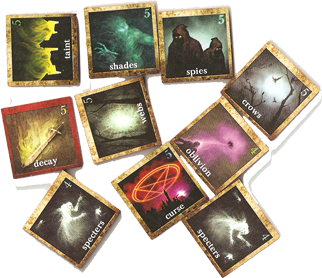 InArkham Horror, however, the players have a lot of choices to make each round, and the events taking place at the various locations throughout the city are varied enough that a kind of narrative builds up over the game. Darkest Night has none of this. It is, as mentioned earlier, a distilled experience – more a game of stamina than exploration. Arkham Horror may beat you up, but at least you get to escape through the woods every once in a while and have some hope of getting free. DarkestNight is more like being strapped into a chair and punched. If you can sit through the abuse long enough, you may come out the victor, but everything before that is just going to hurt. Maybe this isn’t such a bad thing. I have never felt quite as satisfied with winning a game as I have with Darkest Night. Because it is so raw and brutal it ends up being much more of a thinking game than it first appears. Since actions are so limited, you can’t afford to waste one. Players must carefully coordinate their heroes and plan actions out a few rounds in advance to the extent possible. In this, a two-player game of Darkest Night can feel somewhat like cooperative chess. Unlike Arkham Horror, which my game group has regularly invested 5+ hours into before losing in the end, Darkest Night is only going to take you a little over an hour no matter if you win or lose, so a disappointing loss doesn’t come at the end of a massive investment of time. Darkest Night is a sprint, not a marathon. In this Darkest Night may have limited appeal. Personally, I do not mind games that are stacked against the players. Games that aren’t fair can often be thematically appropriate: the Great Old One isn’t supposed to be easy to beat, the zombie hordes aren’t supposed to be easy to escape. I derive a certain amount of (possibly masochistic) pleasure from the struggleof a game like this, so Darkest Night can be very satisfying in this regard. In games that are fair, winning is not only possible, it’s likely with experience, skill and planning. In Darkest Night, even these may not help you in the end. The game is all player interaction. There is no way a single hero can carry this game. Moves are going to be planned and powers coordinated constantly throughout the game. As to variability, the game has a ton. I have mentioned the range of heroes you have to chose from, and even with all my plays of the game I don’t think I have gotten all the heroes to the table. Further, it’s unlikely that when playing a particular hero you’re going to get all that hero’s power to table during a game, meaning the capabilities of even the same hero will change from play to play. In addition, the Artifact cards – which can bestow powerful bonuses on your hero – are hard to collect. I don’t believe I’ve drawn more than ten of these cards across all of my plays, so most of what’s in the deck remains a mystery. Despite the austere mechanics of the game, all of these elements mean that play is going to feel very different from game to game, and can require radically different strategies to succeed. From a mechanics perspective, this is an easy game to play with kids, even those younger than the 13+ recommended age limit. It’s a great game for teaching cooperation and planning, and where adults may find the lack of decision making frustrating, kids may appreciate the narrow focus. However, the game art can be pretty dark and monstrous, so some younger kids who may be sensitive to scary images should avoid the game. Plus, because the game is so brutal, kids who haven’t yet learned about to be good losers and enjoy the experience of playing the game may find the losses discouraging. Darkest Night presents a tough challenge to gamers used to the epic scale of a swords-and-sorcery fantasy game. Victory can be rare, but all the more satisfying because of it. If you’re the kind of person who, after being knocked to the ground during a fight that obviously wasn’t fair, gets right back up and challenges your opponent to a rematch, Darkest Night may be your game. Let’s talk game value. The base game is available from Amazon for $49, and the expansions are $15 and $19 each at CSI when they’re in stock. I bought the base game and one expansion at Gen Con in 2013 at Gen Con premium prices. This is too expensive for this game. The components include two formats of the same small board, a lot of cards, and a number of laser cut cardboard pieces. The boxes for the core game and the expansions are generic red boxes inserted into slipcases. The artwork ranges from good to gorgeous and the rulebook is nicely done. However, no where in this collection of components can I figure out where a $50 base price tag is justified. Indeed, some of these elements – such as the slipcased boxes – suggest some cost savings that don’t seem to be reflected in the price tag. The laser-cut pieces are intended to add to the game’s quality, but they’re just an annoyance. Laser cutting allows the shape of the pieces to me more reflective of what they’re representing. Magic bottles are bottle-shaped, for example. However, the laser cutting means the components are ell edged with soot that must be cleaned off (via an included napkin); plus, the custom cutting made it difficult to pop the pieces out of their sheets, often resulting in a mangled component. I can see what Victory Point was trying to do here, but they would have been better off sticking with die-cut square tokens that didn’t require the extra work. The collection of heroes in the core game and across the expansions are great, creative, gorgeously rendered, and unique. I was impressed how Victory Point Games was able to introduce mechanics for each hero that reflected the hero’s theme, all using some basic dice management ideas. Not only are the heroes individual powers interesting, the ways heroes interact with each other can be a lot of fun to explore. I suspect there are some combinations that can break the game – either for or against the heroes favor – as some games I played with some combinations of heroes felt radically unbalanced. Nonetheless, this is the strength of the game, if you like the core game the expansions are an absolute necessity for the fun of experimenting with the additional heroes. The game plays 1 to 5, but I highly recommend with 2 players, each playing two heroes (in a 5 player game, four players control the heroes and one player controls the necromancer). A hero’s turn is so extremely limited in the number of actions it can take, at one player a hero I suspect each turn would feel unsatisfying, and yet the overall game length would be increased. At two players, it felt like I was getting to make a sufficient number of decisions, and the game was a pretty management time. When I was playing Darkest Night, I played it on a tear – a couple of games a night, a couple of days a week. It was short enough that back-to-back games were possible, and the variety of heroes made the game experience radically different each time. Once I put the game away, though, I haven’t had much of an urge to break it out, particularly since I’m rarely playing two-player games these days. It’s probably time that I take another shot at it, but the compulsion to do so just isn’t there.